If you watched Clerks all the way to the end of the credits you probably noticed the line, "Jay and Silent Bob will return in Dogma." Five years came and went, and despite Jay and Bob returning in both 1995's Mallrats and 1997's Chasing Amy, Kevin Smith's two follow-ups to Clerks were not the Dogma he promised at the end of his debut film. Smith finally got around to making the project he'd been working on for so long, and was it worth the five year wait? Read on. Bartleby (Ben Affleck) and Loki (Matt Damon) are two angels cast out of Heaven and banished for all eternity to Wisconsin after angering God (Alanis Morissette). When they hear about a New Jersey bishop (George Carlin) that is reintroducing a long-forgotten part of Catholic dogma (the "plenary indulgence"), Bartleby and Loki discover a loophole (walk through the church's doors and qualify for heaven), and they go on a road trip to New Jersey. Now while this may sound like a setup for a fun buddy comedy, there's a little snafu. The angel Metatron (Alan Rickman), who serves as God's messenger, appears to Bethany (Linda Fiorentino), a jaded Catholic and abortion clinic employee. After she sprays him with a fire extinguisher thanks to his arrival in a pillar of fire, Metatron explains that if Bartleby and Loki are allowed to re-enter Heaven, God will be proven fallible and all of existence will cease to be. He goes on to inform Bethany that she will meet two prophets, and that she must follow them to the New Jersey church and stop the angels from destroying the universe. Along the way, we meet the "prophets" Jay (Jason Mewes) and Silent Bob (Kevin Smith), a stripper/muse named Serendipity (Salma Hayek), and Rufus (Chris Rock), the lost thirteenth apostle that was written out of the Bible due to his skin color. However, trying to stop Bethany from succeeding is a rogue demon named Azrael (Jason Lee), who wants the angels to succeed and end the universe just so he won't be stuck in Hell anymore. To be totally honest, I'm not too knowledgeable on the intricacies of Catholicism, so all the doctrine and whatnot went over my head. I didn't even know what a plenary indulgence was until I looked it up on the Internet. 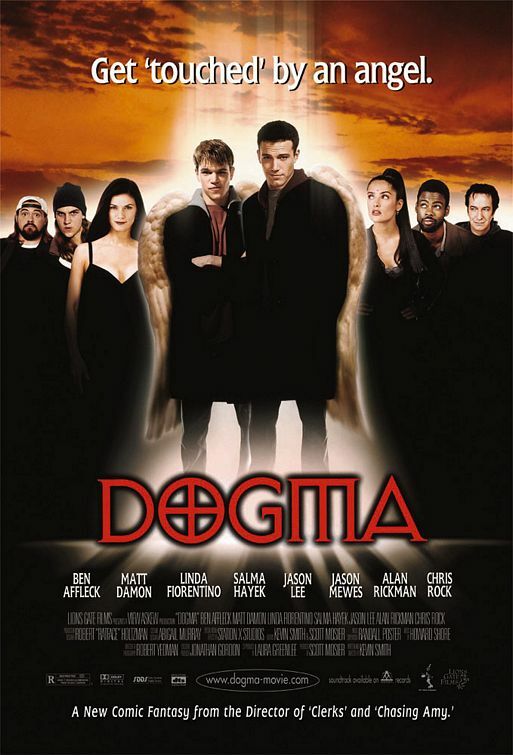 But as someone who holds his religious upbringing in a somewhat high esteem, I thought Dogma was a very enjoyable movie. I don't get why people protested this movie as blasphemous, because I think God would have liked it. Isn't it obvious that He (or as Dogma would lead you to believe, She) has a sense of humor? The duckbill platypus is proof enough of that. Besides, God probably likes to have the occasional laugh at humankind's expense. I would. As usual, Smith's script is good. In this case, it's almost too good. Dogma's long dialogues about religion's place in life seem to be better suited for a novel, but that's not a complaint. The acting, as with Smith's three prior movies, is mostly good. Fiorentino's tough-as-nails portrayal of Bethany is perfect, and Mewes and Smith are once again hilarious as the "hetero life-mates" Jay and Bob. Rickman is also great as the sarcastic voice of God, but the standouts are Affleck and Damon. Their banter with each other and the other characters are some of my more favorite parts of the movie. However, I really disliked Salma Hayek. I'm not a big fan of hers, and she just didn't do anything for me here. Approaching Dogma from a spiritual point of view is good, because the protagonists are a bunch of imperfect dummies out to do what they feel is right. Those who see religion as a bunch of supernatural mumbo-jumbo nonsense won't care too much for it. The same goes for those who don't have a sense of humor when it comes to religion. You know who I mean. The kind of people that thinks a joke that starts with "a priest, a minister, and a rabbi walk into a bar" is blasphemy. Dogma takes religion away from people like Pat Robertson and Jerry Falwell and entrusts it to the unwashed masses. It even suggests that God might actually want people to go to Heaven. Of course, it also suggests that God is a female rock singer from Canada, but that's a different story.